Cash is still the king. Circulation of US dollar (2011) and Indian rupees (Mar 2017). 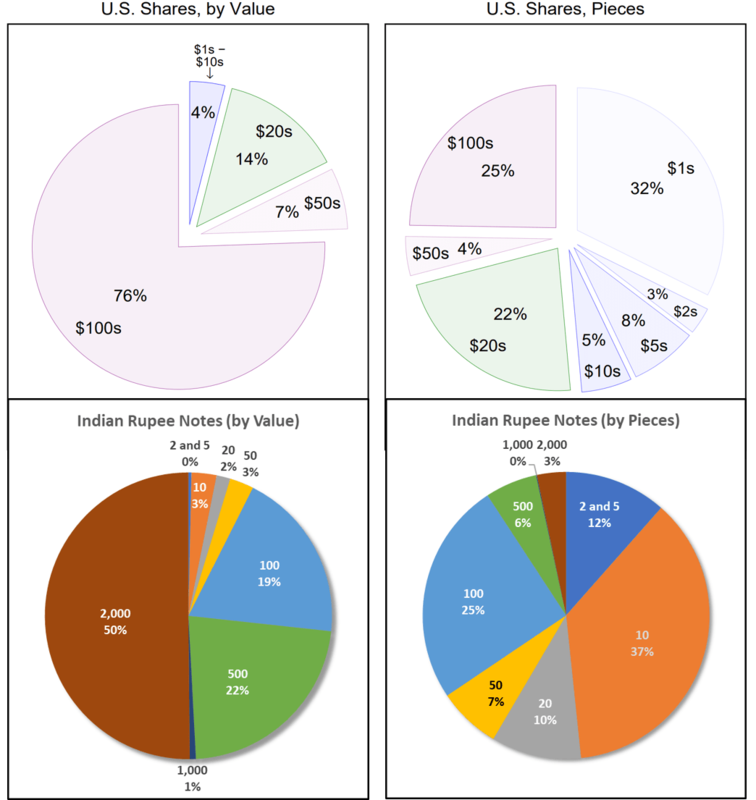 Comparison of US dollar and Indian Rupees in circulation by value & number of bills/notes in circulation. For US dollar, about 25% of all the bills in circulation were $100s, but their worth was almost 76% of all the money. Interestingly, $1 was the largest bill in circulation, at 32%. Most ATMs spit out $20 bills as first choice, and were about 22% of the total bills in circulation during 2011. In comparison, Indian rupee has gone through some serious change after demonetization. The newly introduced 2000 rupee note is only 3% of total notes, but it makes up 50% of the total cash. Previously, 500 rupee notes were very popular but have been slow to come out into market. 1000 rupee note is rarely seen today as it was one of the last big notes to be introduced after demonetization. Interestingly, 10 rupee note is the largest circulating note at 37% followed by 100 rupee note at 25%. As of March 2017, about 100 billion notes are in circulation, at an estimated worth of 13 trillion rupees ($208 million). Meanwhile, the US dollar in circulation, averaged over 2011, was worth $1 trillion increasing to $1.6 trillion today. For the total US currency in circulation, see yesterday’s chart (Sep 12, 2017). Source: For US dollar, Federal Reserve (page 45); for Indian Rupee, Reserve Bank of India annual report 2017 (page 125).